HootSuite Inc., the Vancouver-based social media platform, has announcing another integration into its App Directory this week – this time with one of its own acquisitions. After scooping up social analytics platform uberVU in January, HootSuite released its first integration of that app in its App Directory about a month later. Now, as another fruit of that acquisition, HootSuite is launching uberVU Boards, a tool that provides data visualizations by pinning widgets into dashboards. uberVU Boards allows users to derive business insights through data analytics by building their own custom dashboards, pinning widgets so they can easily identify a metric, pin it, and then create a report just by clicking. That’s designed to take the complexity out of data analytics for new users. Screenshot of uberVU Boards in action on HootSuite. (Image: HootSuite). The tool also allows users to customize their campaigns, managing them in real-time to track key performance indicators and metrics, as well as to check how they’re progressing with their targets. 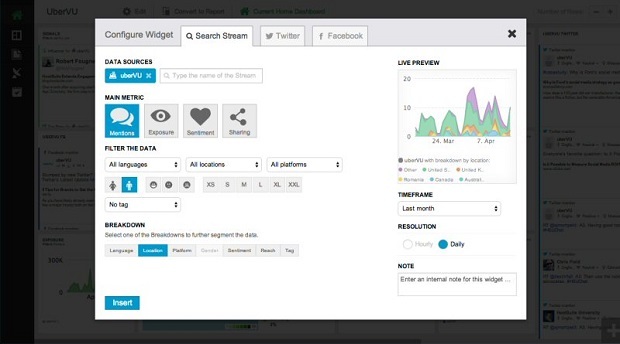 Users can make multiple boards to track different kinds of social analytics for different projects. Plus, uberVU helps users set up a “personalized social media command centre” which can act as their home board. The board can feature any metrics users check daily, like mentions or indications something is spiking or trending in any of their social channels. It also comes with widgets like conversation boards, which allows a social media team to see how audiences are responding and to answer any questions their audience members might have. Conversation boards also make it simpler to respond to questions by putting them all in one place, without requiring users to go back and forth between different tabs. And to stay on top of all of the changes in users’ industries, uberVU users can take advantage of the boards feature to see key conversations. They can use side-by-side views to compare competitors’ performance, and they can collect data on a division, campaign, or metric. And of course, they can build reports based on this data too. Right now, digital marketers expect to be able to use data analytics to track their performances and prove ROI, so HootSuite’s promise of a simpler, easier-to-use social media-based dashboard seems appealing – and it wouldn’t be surprising if more offerings like this one were to crop up in the future.